Use of customized letterhead is a great way to lend credibility to your business while reinforcing your brand identity. While much of our communication is now digital, a written or printed letter on letterhead will make an impression and show your clients or customers that you value their business. It’s a standard component of most corporate identity packages and in the business world, it’s often expected. A letterhead is the heading at the top of a sheet of letter paper. It usually consists of a name, contact information, a logo or corporate design. 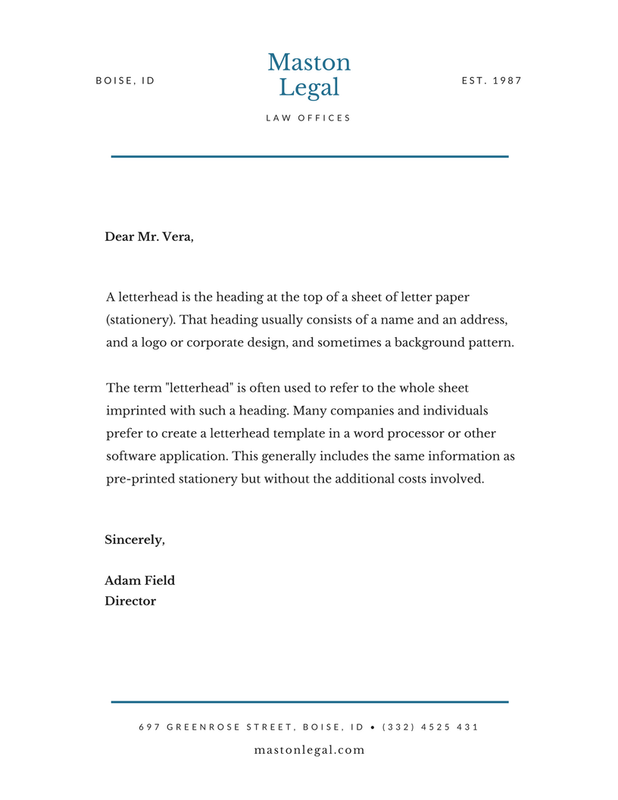 The term “letterhead” is also often used to refer to the whole sheet of paper imprinted with that heading. Your letterhead should support and showcase your content, not compete with it. It should frame the content of the letter without being too distracting. Use a clean design: make use of white space, and don’t crowd the elements of your design. Prioritize your information — decide what’s essential. Keep your fonts to a minimum, and stick to one or two accent colors. 2. Create a visual hierarchy. List your most critical information first. You can guide the eye by creating contrast with font size, styles and color, but don’t go overboard — too much style variation can get distracting. The most important thing is that your name and contact information are easy to read and find. 3. Pay attention to size. Don’t make it so big that it’s distracting. However, you also don’t want your company and contact information to go unnoticed. Find the proper balance. Keep your font size no smaller than 9 pts. Make sure it’s readable. In addition to a logo, some companies include patterns or graphics as part of their letterpress. If your logo uses geometric shapes, you can try using some of these elements to create a pattern. Try to create a design that’s minimal and subtle. To incorporate visuals to your design without using too much space, consider using a watermark. Print your letterhead on quality paper stock with a professional feel. You may also want to consider special finishing options such as embossing, foil stamping or a full-bleed design.